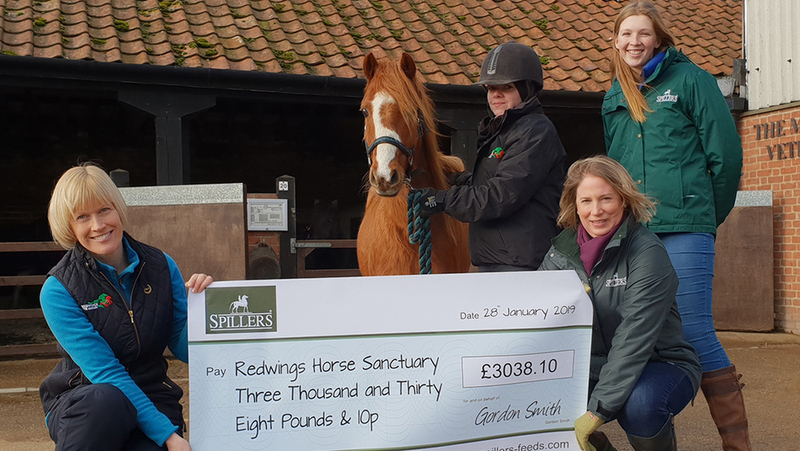 SPILLERS has donated £3,038 to Redwings Horse Sanctuary to help the charity feed its senior horses and ponies over the winter. The manufacturer made the generous gift by contributing 30p for every promotional bag of its new SPILLERS Senior Complete Care Mix, SPILLERS Senior Super-Mash and SPILLERS Supple + Senior Balancer sold during the launch period of the new products at the end of last year. SPILLERS Senior Complete Care Mix and SPILLERS Senior Super-Mash are the new flagships for the versatile SPILLERS range of senior feeds which also include SPILLERS Senior Conditioning Mix and SPILLERS Supple + Senior Balancer. They have all been veterinary approved to give horse owners extra peace of mind. SPILLERS has also introduced a new ‘Senior Friendly’ logo to help horse owners easily identify other senior suitable products within the SPILLERS portfolio. Featured image: Nicola Jarvis, Toby, Talita Arantes, Redwings Hapton Farm Manager, Clare Barfoot and SPILLERS Brand Assistant Bella Fricker with the big cheque from SPILLERS.